A party just isn’t complete without cake, right? 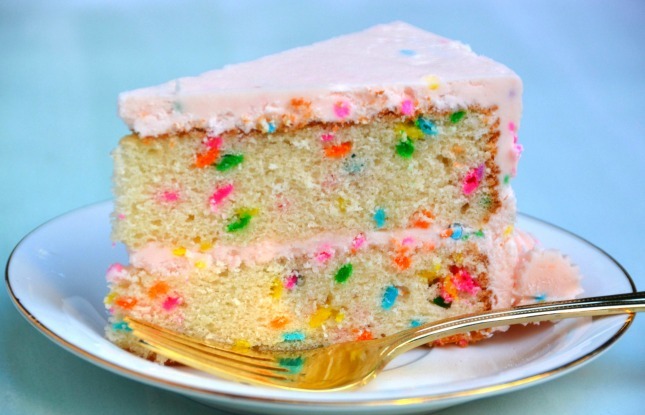 Surprise and delight your party guests with a cake that is delicious, fluffy, and full of confetti sprinkles, all topped with a sugary-sweet frosting to match – and the best part is that it’s such an easy dessert to make! Don’t forget to save yourself a piece though, because this cake will be gobbled up before you know it! Preheat the oven to 350 degrees F. Butter and flour two 8-inch round cake pans, line the bottoms with parchment paper and set aside. In a small bowl, mix together the milk, egg whites and vanilla. Set aside. Sift the flour into the bowl of a stand mixer fitted with the paddle attachment. Add the sugar, baking powder and salt and mix together on low speed. Add the butter and continue mixing on low speed until the mixture is crumbly. Pour in all but 1/2 a cup of the milk mixture and beat on medium speed for 90 seconds. Add the remaining 1/2 cup of the milk mixture and beat for 30 seconds more. Stop the mixer, scrape down the sides of the bowl and then beat on medium speed again for 20 seconds. Divide the batter evenly between two bowls (about 1 lb 5 ounces per pan) and fold 1/4 cup of confetti sprinkles into each bowl. Scrape the batter into the prepared cake pans and bake until a toothpick inserted in the center comes out clean, about 27 – 35 minutes. Allow the cakes to cool in the pans for 10 minutes before turning out onto a wire rack to finish cooling. Sift the confectioners’ sugar before measuring it or sift it directly into a bowl placed on a scale and weigh as you go. In the bowl of a stand mixer fitted with the whisk attachment, mix butter and salt on medium speed for about 30 seconds, until creamy. Turn the mixer speed down to low and add the confectioners’ sugar, mixing until well blended. Turn the speed back up to medium and beat for 2 minutes. Add the vanilla. Stop the mixer and scrape down the bottom and sides of the bowl. If you feel that your frosting is too thick, add a little of the whipping cream, 1 tsp at a time. Add a few drops of pink food colouring and mix to combine. Stir in the sprinkles. When you’re happy with the consistency and colour, you can begin to assemble your cake. Using a serrated knife, slice off the top/dome of each cake layer to level it. 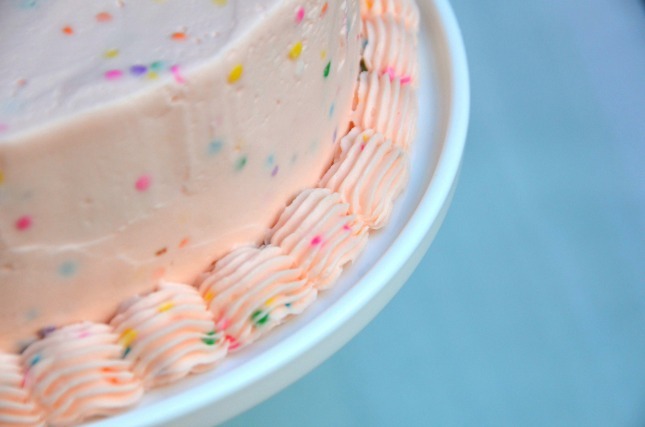 Add a level layer of frosting to one cake layer, and place the next layer on top. 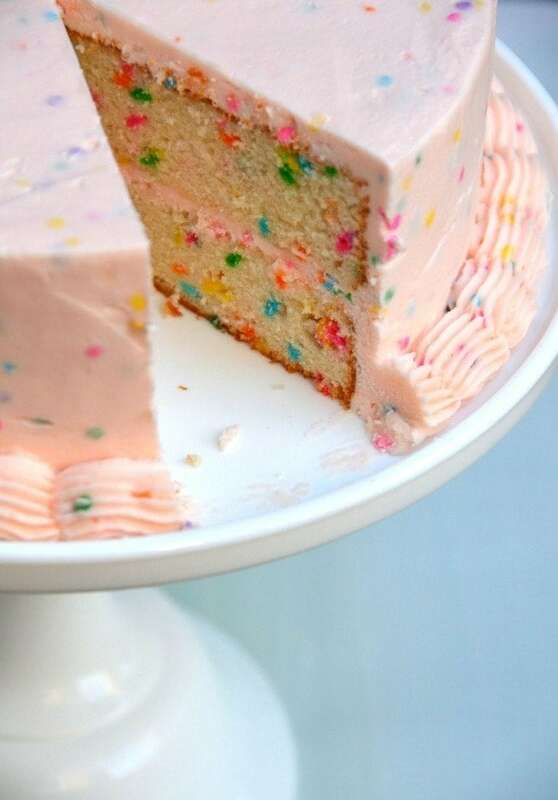 Using a palette knife, add a very thin and even layer of frosting all over the entire cake, and then pop it in the fridge to chill for about 30 minutes. This is called crumb coating, and the thin layer of frosting will help to hold the crumbs to the cake, so that you don’t end up with them in your final coat. Carefully move the chilled cake onto the plate you’ll be serving it on (if it’s not already). Once the cake is chilled and the frosting has firmed up, it is time to add the final coat of frosting. Pipe a border around the base of the cake (I used a French tip). Slice, eat and enjoy! I am going to make this for my daughter’s birthday party on Sunday. I can’t wait to try this out! Can you use the whole egg instead of egg whites ?